Manuel, is a shy but diligent young person, who approached me to work as a volunteer within the UF/IFAS Extension Program I conduct in Miami-Dade County for commercial ornamental clientele. I still remember one of his emails quoting: I am available any hour from any day Ms. Campoverde, he said. Since then, Manuel has been helping me with several Extension duties such as 4-H science camp, work safety evaluations and a cold injury experiment monitoring. He needed some volunteering hours to complete academic coursework at Miami-Dade College. He is studying towards two Associate degrees: Science in Landscape and Horticulture Technology and Arts in Business Administration. When Manuel is not studying, he is working on his ornamental business named: Rabbit Nursery. This is his family business and they grow beautiful crotons and Ficus “Green Island” for other nurseries and landscape companies. On top of this, Mr. Ponce is currently the vice-president of the Horticulture Club in Miami-Dade Kendall campus (nursery). I ask him What would he like to do next? 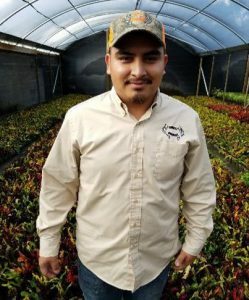 Manuel said: Once I graduate, I will continue working in the nursery and try to expand the business. Thank you Manuel for providing your time and assistance during these Spring months.